Hook: Fulling Mill Jig Force #10-18. Bead: Hanak rouge gold 3.0mm. Tail: Hares Mask fur gaurd hair. Hackle: Brahma hen, speckled tan, in dubbing loop. Collar: Muskrat gray hares mask fur. Bead: Hanak metallic brown 3.0mm. Rib: Copper brown metallic tinsel. Abdomen: NS Snowshoe rabbit foots dubbing, pheasant tail. Hackle: Speckled rust CDL hen saddle in dubbing loop. Hook: Fulling Mill Jig Force #12-18. Thread: Veevus 14/0 white - the only thread I found that fluoresces under UV illumination. Body: Hends two-tone body quill #BQ-53 (coming soon). Resin: Solarez Thin Hard Formula. Bead: Hanak Metallic pink 4.0mm. Collar: Sparse, dark spike mix (%50 / %50 black rabbit and fox squirrel). Thread: 50D GSP black thread. Abdomen: Equal parts black, red brown and brown Hemingway’s Frosty dub. Tail: Caddis green z-lon melted on one end to form a small head. Collar: Grizzly hen hackle tied at rear. Thread: 50D GSP white. Marked with brown marker at whip finish. Hitch: Flymen™ articulate shanks cemented on with tight wraps of the GSP thread. Underbody: 1.5 layers of flat lead tape. Build small taper by adding the other half layer near the front of the fly. Body: Half round Body Glass #14 red brown, wound flat side up spaced apart that the resulting gap equals the width of the body glass. Start wraps tight and loosen to form additional taper. 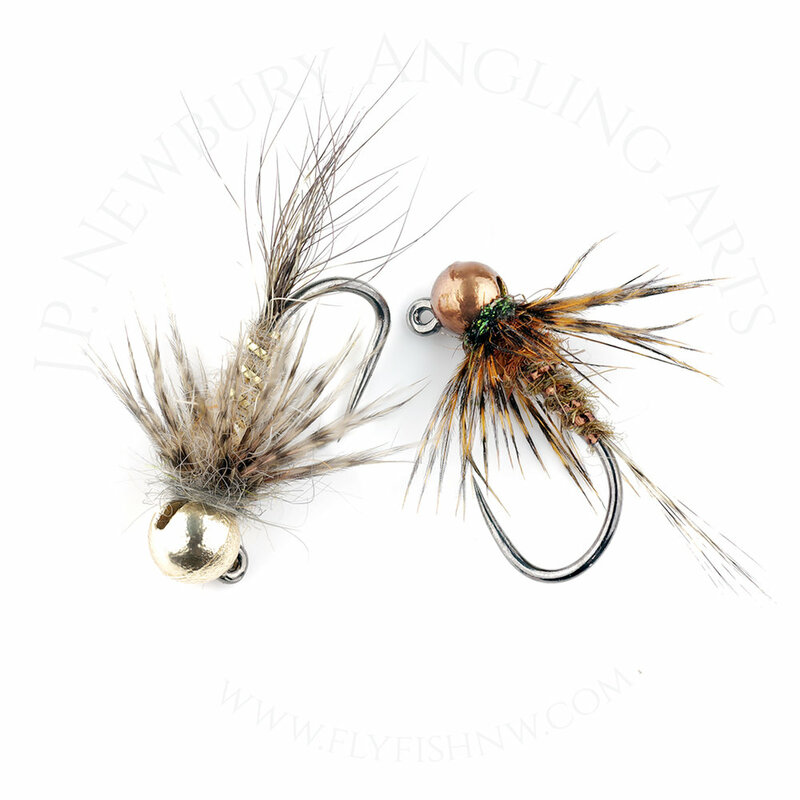 Rib: Senyo’s tan shaggy dub in a GSP thread loop spun tightly with natural hares mask fur. Wrap tightly between the spaces of the body glass and brush out frequently with a wire brush while wrapping. Trim to a short cone shape exposing the body glass. Collar: Grizzly hen neck, 1-2 turns only. Tail: Australian Possum and pearl pink holographic tinsel along sides. Rib: Small oval gold french tinsel. Thorax: Dyed mottled gray Brahma Hen saddle and squirrel body fur in a composite dubbing loop using a Marc Pettijean magic tool or similar tool. Collar: Squirrel body hair followed by black hare’s mask for. Pink Glo-Brite thread. Option one has tan Brahma Hen added to the dubbing loop. Abdomen: Small silver and black wire wound together, optional UV resin coat. Thorax: UV pearl tinsel. Black peacock ice dubbing. Wingbuds: Medium blue dun cdc puffs. Abdomen: Montana Fly Company Frog Hair UV chartreuse. Thorax: Gray hare's mask dubbing followed by black hare's mask dubbing. Wingbuds: Dyed medium dun Brahma hen. Abdomen: Caddis green pheasant tail. Wrap over a thin coating of superglue for added strength. Thorax: Hends Spectra #33 Cinnamon. Abdomen: Hen pheasant tail fibers. Wrap over a thin coating of superglue for added strength. Thorax: Hends Spectra #45 dark brown. Note: Hen pheasant tail has the perfect mottled banding perfect for imitating the light and dark bands of coloring that are present in many of the Ephemerella species. Abdomen: Nature's Spirit Snowshoe hare olive brown..
Thorax: Brown hares mask dubbing. Tail: Red saddle hackle fibers. Abdomen: Veevus rainbow holographic tinsel. Note: treat with UV resin for added durability. Bead: Hanak matte black Round+. Also pictured a tungsten "raw" bead. Abdomen: Dark Spike blend ( %50 fox squirrel %50 black hares ear). Rib: Perdigones Pearl Body - Violet - ultraviolet effect. Under certain lighting conditions such as when the blue wavelengths of dusk, dawn and deep winter dominate, blue, purple and pink, colors with high UV fluorescence can almost be magical. I learned this swinging bright purple and blue wet flies for steelhead in the Pacific Northwest during the blue hour to be very effective strategy. This is a simple jig to tie and a nice variation to carry. Bead: Hanak matte black Round+. Thorax: Sybai Fine Super UV Dubbing dark brown. A color shift into a darker slightly more olive color as I have observed many naturals that I have sampled when out fishing. I have a strong preference for metallic brown beads instead of copper as a fresh color the fish are not keenly aware of. Bead: Hanak metallic brown Round+. Tail: Dyed olive brown pardo CDL. Abdomen: Dyed olive pheasant tail. Thorax: Hends Spectra Dubbing #355. Bead: Metallic pink slotted tungsten. Tail: Shell pink antron yarn. Body: Gray hares mask dubbing. Rib: Blue pearl UV mylar. Bead: Hareline pink tungsten slotted. Underbody: White Uni-Stretch 1x to form Taper (large sizes only). Rib: SM Veevus opal tinsel. Rib: Hends Perdiones Body PBF35. Bead: Slotted metallic orange tungsten bead. Underbody: Build up a taper with Uni-Stretch. Tail: Dark mottled pardo Coq de Leon (CDL). Choose feathers with heavy mottling. Abdomen: Hemmingway’s Hare Dubbing orange. Rib: Sybai pearl orange flat tinsel. Counter Rib: Uni dubbing brush wire sm. Thorax: Hends Spectra dubbing #35. Collar: Natures Spirit black hares mask dubbing. Bead: Metallic olive slotted tungsten. Abdomen: Hends Perdigones Body PBF #34. Thorax: Hemingway’s Peacock UV green. Body: Black & Silver Uni-wire SM wound together over wrapped with UTC pearl tinsel - ice blue. Thorax: Rainbow spectra ice and Hare’e Ice Black. Underbody: Thread to form taper. Body: Tan(BQ13) and yellow gold(BQ4) body quill. Rib: 14/0 brown thread. Treat body and rib with a thin coat of UV resin. Underbody: Uni-Stretch 1x to form taper. Body: Tan hares mask dubbing. Rib: Medium oval gold french tinsel. Legs: Grizzly micro legs bone. Collar: Dyed tan speckled Coq de Leon hen saddle.